When you dream of seeing a particular city all your life, a strange dichotomy occurs when you do at last arrive there- for there is the city you dreamt of all those years, and the actual city. The dream city is always a little ethereal, a little too perfect. For instance it’s not usually hot as Hades in your dream city, nor do you have a little thing called the Venetian Pestilence. (yes, I named it myself, but you’re allowed to do that on vacation when you feel like you might die in Venice). Venice…just the name alone conjures up magical images, like a city in the clouds, made of something less substantial than other cities, less substantial and far more beautiful. 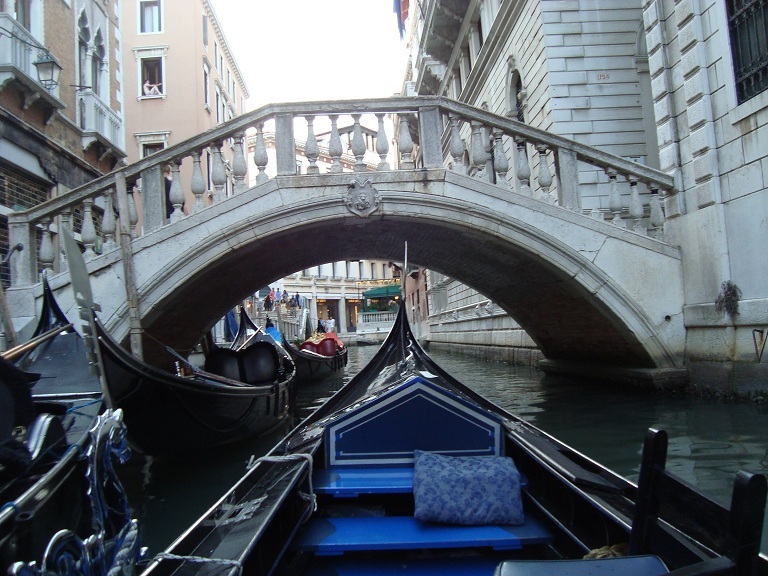 Long ago, I set a section of my ongoing story in Venice, and recently I realized it fits into the storyline of book four (on which I am currently working), then the offer of this trip came up very unexpectedly. Synchronicity is a beautiful thing, and when you recognize it, it presents itself fairly often in life. Venice, however, was slow in presenting her magic. First of all there was the horrible cold I had caught somewhere along the way. You know those kind of colds that make you feel like you are separated from the rest of humanity by some strange invisible bubble, that makes it impossible to hear or communicate properly with the world. Secondly, there was the unsettling feeling, from the moment we pulled up to the wharf in our water taxi, that I had most definitely been there before, and that things didn’t look as I remembered them. It was annoying more than anything, like someone tapping on your shoulder endlessly, yet when you turn around no one is there. The minute you turn back, they continue to tap. Venice thoroughly discombobulated me, so if what follows seems semi-incoherent, I am blaming it on La Serenissima. Walking through the Doges’ Palace in the grip of a fever, with sweat beading on me like I was a tubercular poet about to die, I crossed the Bridge of Sighs and suddenly couldn’t breathe. I had to rush off the Bridge and then rush through the prison cells. I had that cold hand on my shoulder that made me certain I had been there before and not under happy circumstances. Later, I am never certain what to make of such feelings- only in the moment they are so very real, and I have always been a believer that there is so much more in this world than we can understand with our first five senses. At night, Venice is a city of ghosts. The tourists have all long gone to bed, except for a few of us stragglers and all there is, is stone and water, and a city that knows her glory days passed long ago. Walking, the sound of your steps echo off the stone, get swallowed up in the water and your heart beats faster and faster. It’s easy to become lost in Venice, it’s expected that you get lost at least three times on any given walk. At 2 am, the charm of this lessens considerably. Yes, ghosts, they seem thick upon the air of Venice. And it was in Venice that I heard bells ceaselessly ringing one night though my friend couldn’t hear them at all (bad Italian cold medicine? The beginning of tinnitus?). I thought it was a phone in another room that someone just kept trying to ring through on. But it went on for hours and it was starting to drive me a little mad. Somehow the bells just seemed a part of that feeling I kept having of having been in Venice before, and half expecting to run upon some former version of myself around a corner. Time feels more malleable in Venice, as if the change of element from the familiar earth to that of water, gives time the slip. Speaking of time slips, Venice is where I met Marco. Marco who swore that I had been in his bar three years before, and got a little irate with me when I assured him I had never been in Venice before in my life. After a few hours of him asking me why I refused to remember our previous meeting I said perhaps it had been three hundred years, rather than three and that we were caught in a time loop- to which he replied ‘cie, like ‘Terminator’. So even in Venice, boys are really just boys. He was vehement enough that I started to wonder if I *had* slipped into some strange time/space conundrum, and simply couldn’t recall having visited before. He made me angry with his certainty, because he was, like the city, discombobulating me with that certainty. Venice hides behind a façade of masques and fancy dress, she does not give you her soul, but she takes a piece of yours, whether you want her to or not. The only section of the city in which I felt utterly peaceful was the Jewish section-I could have happily whiled away a summer in its confines. It was quiet there, unlike the rest of Venice. Hot and still, with the soft lap of the canals against ancient stone. The Jewish quarter was once the Jewish Ghetto. A place where Jews were not allowed to leave from sundown to sunrise for over two centuries. Oddly, it was a place of peace, still in the afternoon heat, but like seeing a slice of a real city, not a confection for tourists. That day was the one on which I found Jamie’s palazzo, grey and quiet, behind wrought iron gates, almost hidden in drifts of golden honeysuckle. I had been looking for it, and knew it the moment I saw it. Those moments, as a writer, are like stepping for a time into an alternate universe. In my writing head, I spent the rest of the afternoon with His Lordship, seeing the Venetian summer through his eyes, understanding its particular poetry through his thoughts. Like the contrary soul she is, Venice gave me a perfect golden moment on my last evening there. We stepped out into St. Mark’s Square, the sun gilding all that beautiful white stone and the lagoon a dazzling azure beyond. A band was playing ‘Gabriel’s Oboe’ by Ennio Morricone- one of the most beautiful pieces of music ever composed and one I listened to endlessly during the writing of my last book. To hear it played there in that place was the sort of moment you dream of finding in the city of your dreams. In the end, though she threw me off guard, I did indeed love this city of moonlit glass and decaying stone, this city of ghosts and music and echoes and fallen angels. In Venice, I concluded, the ghost that haunts one is oneself.